There is nothing more satisfying than watching your favourite TV programme on a fresh-cleaned sofa! With us, you can count on a professional upholstery cleaning service in London, executed to the highest standards. We use various industry-powered techniques to remove tough stains and sanitise your furniture while taking into careful consideration the type of fabric that it is made from. When cleaning any upholstery, the technicians follow an industry-standard procedure of steps in order to ensure the best results. Upon arrival, the technicians inspect the type of fabric of your soft furniture to determine the most suitable cleaning method that needs to be applied. Then, they thoroughly vacuum the piece to remove all hard particles and dust. Next, the cleaning operatives pretreat all traces of spills, pet soiling and any smudges with a professional stain removal solution. As a final step, the furniture is expertly steam or dry cleaned, depending on what its made of, with industry-powered upholstery cleaning equipment. This method uses a powerful steam cleaning machine with special upholstery cleaning extensions and attachments. It is suitable for heavily soiled and badly stained synthetic fabrics. The technique incorporates the use of hot water, a professional solution and high pressure. Your upholstered sofa, settee and armchairs are first sprayed, and then, the equipment is used to extract the moisture (up to 95%) along with the grime, leaving your furnishings looking as new. A drying time of 2 to 4 hours applies. Textiles made from more delicate natural fibres, bright-coloured fabrics, as well as suede, generally benefit from being dry cleaned. The procedure involves the use of foam or a dry powdered solvent, which interfere with the dirt after a process of agitation. A powerful vacuum cleaner is employed at the end to remove the dissolved soils and the detergent. The method brings back the original look of your furniture, leaving it virtually dry and ready to use straight away with no chemical residues left behind. Our leather sofa cleaning solutions are designed to restore the great look of your luxurious items and extend their life. 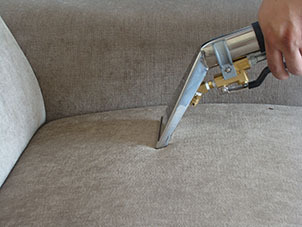 The qualified upholstery cleaners apply a professional leather cleaning product with a soft brush that is subsequently polished off with a cloth. Your sofa or lounge is then buffed with a leather rejuvenator as a final touch. The method is also applicable for pieces made from eco-leather. The recommended drying time is about an hour. When the cleaning procedure is done, the product is applied evenly to the upholstered item. After it gets dry, your upholstery will be protected from future soiling without its breathability being harmed. Our upholstery cleaning rates for London start from £18 (for armchair cleaning with hot water extraction). We also offer discounted prices for booking additional services like professional carpet cleaning or guaranteed move out cleaning. We also specialise in a variety of additional textile cleaning services around London. We provide steam mattress cleaning and bedding disinfection. Did you know? Your mattress contains hundreds of thousands of dust mites and other bacteria which can be the cause of respiratory symptoms, rashes and allergic diseases. Let us take care of your mattresses for you, we will sanitize and freshen them up professionally. Our upholstery services are also suitable for all type of blinds, drapery and curtains – we have the experience, equipment and expertise to take care of your soft furnishings and fabric accessories at home and clean them to the highest standards. Any of these cleaning solutions can be combined with your upholstery or carpet cleaning service or booked separately when you need. For a free quote and to schedule a service, please just give us a call. We operate a 24/7 customer service hotline, so we are always ready to answer all your questions on 020 3404 6962. You can also get in touch with us online at your convenience by using our contact form to book your upholstery cleaning in London.